(CNN) -- A one-of-a-kind bicycle belonging to U.S. cycling legend Lance Armstrong was stolen from a team truck in California just hours after he rode it Saturday on the first day of a nine-day race. Lance Armstrong is racing in the California Amgen Tour as he attempts a comeback after retiring in 2005. Cancer survivor and seven-time Tour de France champion Armstrong is racing in the Amgen Tour of California this week as he continues his latest comeback after retiring from the sport in 2005. Armstrong's first comeback came in 1998, two years after he was diagnosed with advanced testicular cancer that had spread to his lungs and brain. Doctors gave him a less than 50 percent chance of survival. Armstrong announced the bike theft on his Twitter account Sunday morning and posted a photograph. "There is only one like it in the world therefore hard to pawn it off. Reward being offered," the Texan wrote before going out and finishing fifth in Sunday's testing first stage won by Spain's Francisco Mancebo. Swiss Olympic champion Fabian Cancellara, who started the day in the yellow jersey after winning Saturday's time-trial prologue, pulled out midway through the stage feeling unwell. Armstrong improved from 10th to fifth overall, one minute five seconds adrift, with Astana teammate Levi Leipheimer, the two-time defending champion, in second place behind Mancebo. "Holy hell. That was terrible," commented Armstrong who had a puncture. "Maybe one of the toughest days I've had on a bike, purely based on the conditions. I'm still freezing." 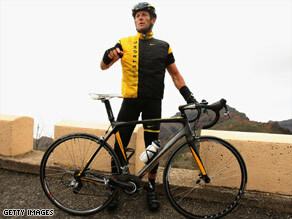 The bicycle that was stolen is not the one that Armstrong rides every day during the race. The stolen bike is used only for time trials, a race in which cyclists ride individually at staggered intervals over a set distance and try to get the best time. The thieves took four bikes from a truck Armstrong's Astana team had parked behind a hotel in Sacramento. The other three bicycles belonged to team members Janez Brajkovic, Steve Morabito and Yaroslav Popovych, Astana said. Armstrong, 37, won the Tour de France, considered the premiere bicycle race in the world, a record seven times from 1999-2005. The 750-mile Amgen Tour of California ends Sunday. It is the second major race in which Armstrong has participated since announcing his comeback in September. He raced last month in the Tour Down Under in Australia, finishing 29th. Armstrong said he is aiming for another Tour de France victory this summer and was not expected to contend in the Australian race, which he used to gauge his fitness level after more than three years out of the saddle.